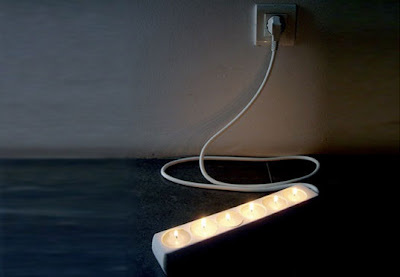 The MAX5000W candle holder is an interesting concept from Kathi Stertzig and Albio Nascimento, as part of their DESIGNFORFUTURE project, also published about in my Ad!dict 'World 2.0'. DESIGNFORFUTURE is an annual exhibition focussed on design projects that contemplate environmental and social impact in their stages of development and through their usage. Eco-efficient design is not defining itself through ecomaterials, or efficient production only, but also through understanding and reflecting on common ways of using our objects, which is what this design does so humorously. Although it wasn't created with the South African power issues in mind, I must admit that MAX5000W could be a great solution for Eskom, no? Take a look at Kathi Sterzig's Labfile on Addictlab.